Speaking of gorgeous greens (What? You weren't? But it's spring! ), contributor Jim Dixon of RealGoodFood is dreaming of what he can do when those lumpy, spongy pods start hitting the markets in the next few weeks. 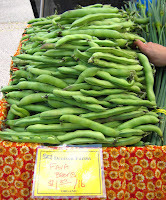 I haven’t actually purchased any any fava beans yet this year, and the local crop is still at east a month away. 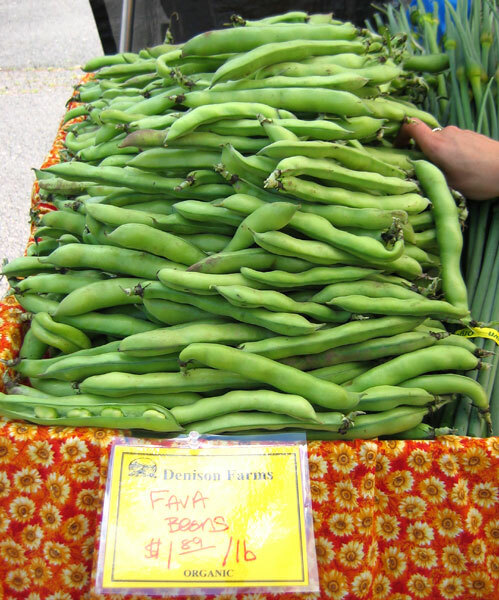 But favas (fave is the plural in Italian) from further south should be available. I had some at a winemaker’s dinner last week—beautifully prepared and hosted by the winemakers Jan-Marc and Barbara Baker—cooked simply in good butter. When I have the time to sit and and shuck, parboil and peel a pile o’fave for myself, I’ll make this. Since a pound of fava pods yields maybe a cup of the edible inner bean, this spread stretches them so you don’t need to shuck quite so many. For enough for four people, start with at least a pound of pods, although another half would be better. Split open the long pods with your thumb and strip out the beans, still in their tight, pale green skins. This will take about 30 minutes if you’re fast. 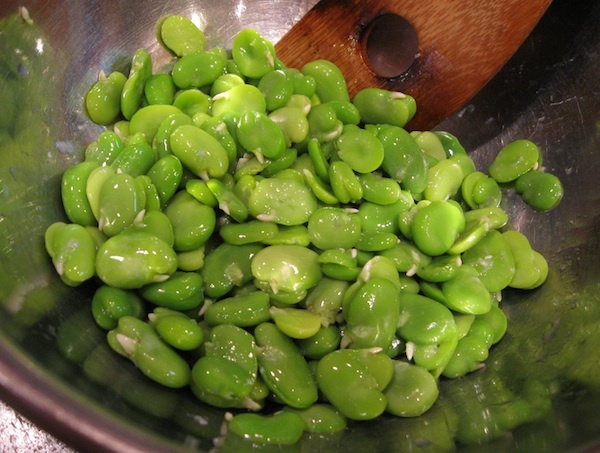 Get a medium saucepan of water boiling, toss in a little salt, and add the beans. Let the water return to a boil, cook another minute, then drain and run a little cold water over the beans so you can handle them. I find the easiest method for getting the bean out is pinching the skin open at one end and gently squeezing until the bright green bean pops out. It’s fine if the beans split, and most will. Plan on another 10-15 minutes for this. Combine the shucked, peeled fave in the food processor with at least a cup of tightly packed fresh mint, a couple cloves of garlic, a splash (about a tablespoon) of Katz Late Harvest Sauvignon Blanc vinegar (the sweet note works well with this), a long pour of good extra virgin olive oil (at least a half cup) and pinch of sea salt. Process, taste, adjust salt, oil, or vinegar and process again to a uniform but slightly coarse paste. Toast or grill good bread (New Seasons wheat levain is my daily bread, Ken’s or other good loaf fine), spread with fava mix, drizzle with a bit more oil, and eat. So here's another tip to put this bruschetta over the top... literally! Top off the pea mash with a dollop of your freshest ricotta before sprinkling with olive oil.. Heavenly!